Apps often include settings that allow users to modify app features and behaviors. 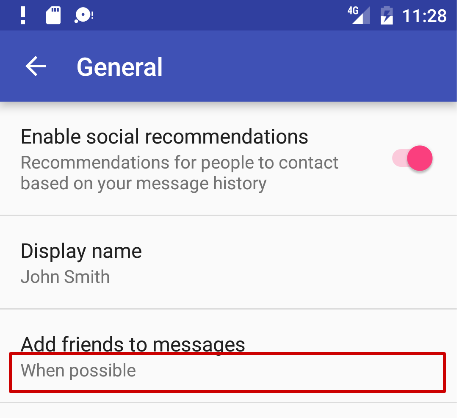 For example, some apps allow users to specify whether notifications are enabled, or how often the app syncs data with the cloud. Most settings are accessed infrequently, because once users change a setting, they rarely need to go back and change it again. If users need to access a control or preference frequently, consider moving the control or preference to the app bar options menu, or to a side navigation menu such as a navigation drawer. Represent the value most users would choose. 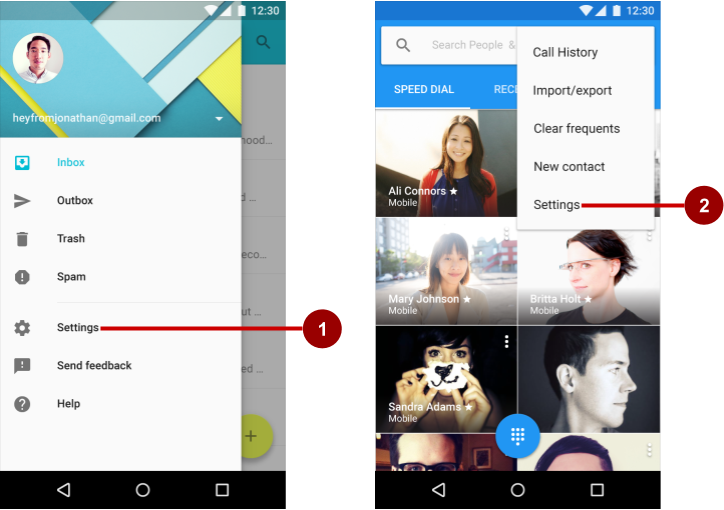 For example, in the Contacts app, All contacts is the default for "Contacts to display". Use less battery power. For example, in the Android Settings app, Bluetooth is off until the user turns it on. Pose the least risk to security and data loss. 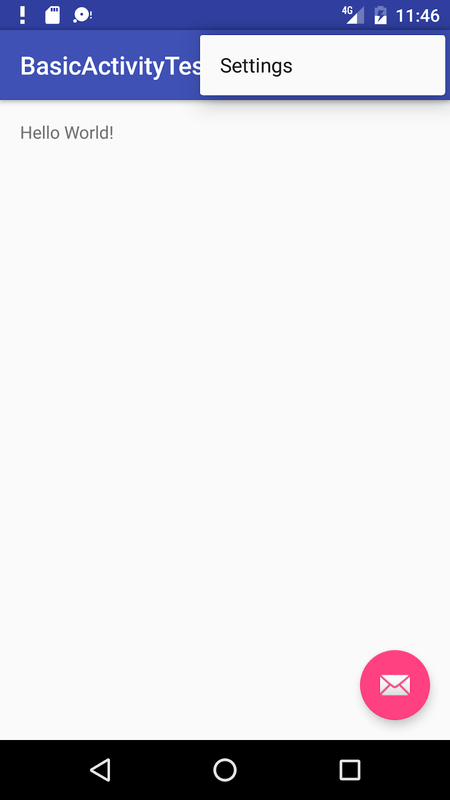 For example, in the Gmail app, the default action is to archive rather than delete messages. Tip: If the setting contains information about the app, such as a version number or licensing information, move the setting to a separately accessed Help screen. Build an app&apos;s settings using various subclasses of the Preference class rather than using View elements. Preference provides the View to be displayed for each setting, and associates with it a SharedPreferences interface to store and retrieve the preference data. SwitchPreference: Creates a two-state option that can be toggled (such as on/off or true/false). EditTextPreference: Creates an item that opens a dialog with an EditText element. The saved value is a String. RingtonePreference: Lets the user choose a ringtone from those available on the device. Inside the above layout is a SwitchPreference that shows a toggle switch to disable or enable an option. 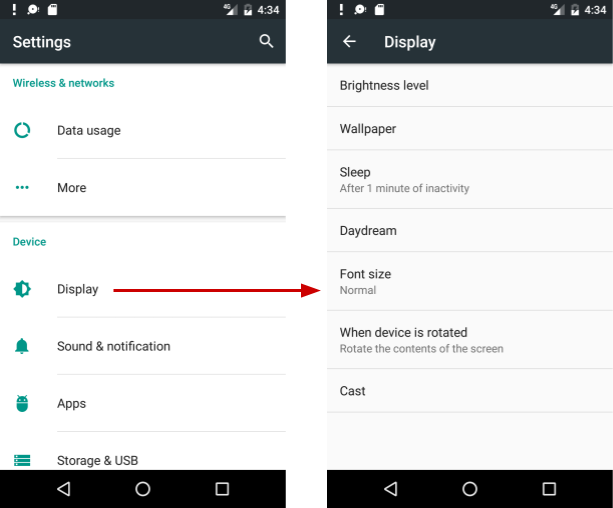 android:key: The key to use for storing the setting value. Each setting (Preference) has a corresponding key-value pair that the system uses to save the setting in a default SharedPreferences file for your app&apos;s settings. An EditTextPreference shows a text field for the user to enter text. A ListPreference shows a dialog with radio buttons for the user to make one choice. Save the XML file in the res/xml directory. Although you can name the file anything you want, it is traditionally named preferences.xml. 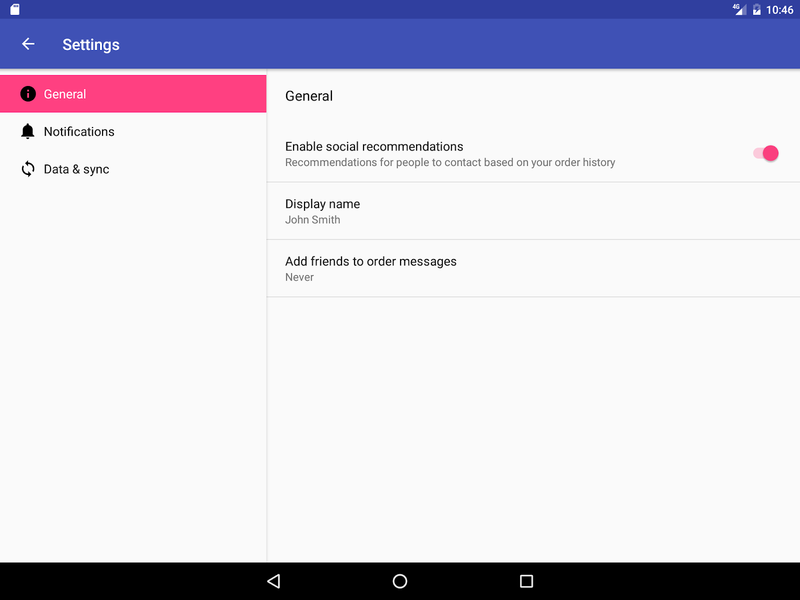 For an app that supports Android 3.0 and newer versions, the best practice for settings is to use a Settings Activity and a Fragment for each preference XML file. Add a Settings Activity class that extends Activity and hosts a fragment that extends PreferenceFragment. To remain compatible with the v7 appcompat library, extend the Settings Activity with AppCompatActivity, and extend the Fragment with PreferenceFragmentCompat. A Fragment like PreferenceFragment provides a more flexible architecture for your app, compared to using an Activity alone. A Fragment is like a modular section of an Activity—it has its own lifecycle and receives its own input events, and you can add or remove a Fragment while the Activity is running. Use PreferenceFragment to control the display of your settings instead of PreferenceActivity whenever possible. To set Up navigation for the SettingsActivity, be sure to declare the SettingsActivity parent to be MainActivity in the AndroidManifest.xml file. // ... Handle other options menu items. // ... Handle other navigation drawer items. When the user changes a setting, the system saves the changes to a SharedPreferences file. As you learned in another practical, shared preferences allow you to read and write small amounts of primitive data as key/value pairs to a file on the device storage. A boolean indicating whether the default values should be set more than once. When false, the system sets the default values only if this method has never been called in the past (or the KEY_HAS_SET_DEFAULT_VALUES in the default value SharedPreferences file is false). As long as you set this third argument to false, you can safely call this method every time MainActivity starts without overriding the user&apos;s saved settings values. However, if you set it to true, the method will override any previous values with the defaults. Each Preference you add has a corresponding key/value pair that the system uses to save the setting in a default SharedPreferences file for your app&apos;s settings. When the user changes a setting, the system updates the corresponding value in the SharedPreferences file for you. The only time you should directly interact with the associated SharedPreferences file is when you need to read the value in order to determine your app&apos;s behavior based on the user&apos;s setting. All of an app&apos;s preferences are saved by default to a file that is accessible from anywhere within the app by calling the static method PreferenceManager.getDefaultSharedPreferences(). This method takes the context and returns the SharedPreferences object containing all the key/value pairs that are associated with the Preference objects. // ... Rest of onCreate code. The code listens to a change in the switch setting using onPreferenceChange(), and returns true. It then determines the new boolean value (newValue) for the setting after the change (true or false). If true, the code edits the SharedPreferences file (as described in a previous practical) using SharedPreferences.Editor, putting the new value (string.option.on) as a string in the summary using putString() and applies the change using apply(). If false, the code does the same thing with the new value (string.option.off) as a string in the summary. If you need to build several screens of settings and you want to take advantage of tablet-sized screens as well as maintain compatibility with older versions of Android for tablets, Android Studio provides a shortcut: the Settings Activity template. 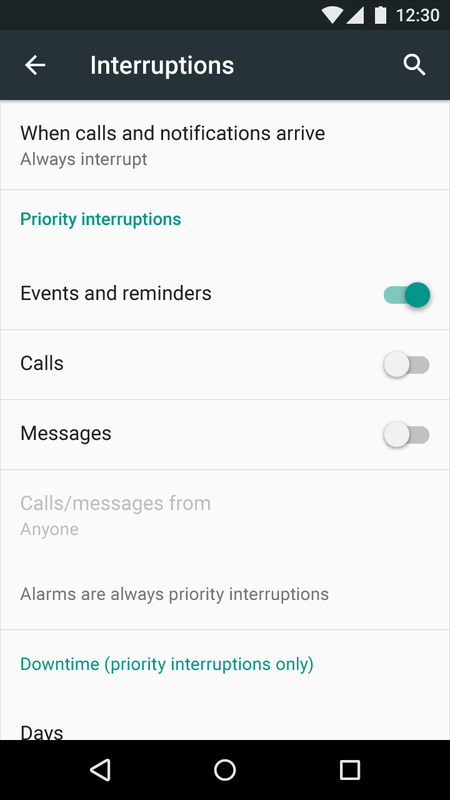 Phones: A main Settings screen with a header link for each group of settings, such as General for general settings, as shown below. 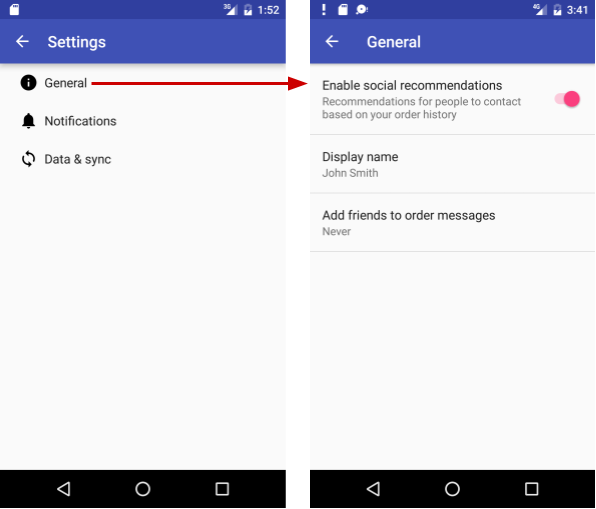 In general, you need not change the Settings Activity template code in order to customize SettingsActivity for the settings you want in your app. You can customize the settings titles, summaries, possible values, and default values without changing the template code, and even add more settings to the groups that are provided. To customize the settings, edit the string and string array resources in the strings.xml file and the layout attributes for each setting in the files in the res > xml folder in the Project > Android pane. You use the Settings Activity template code as-is. To make it work for your app, add code to MainActivity to set the default settings values, and to read and use the settings values, as shown later in this chapter. 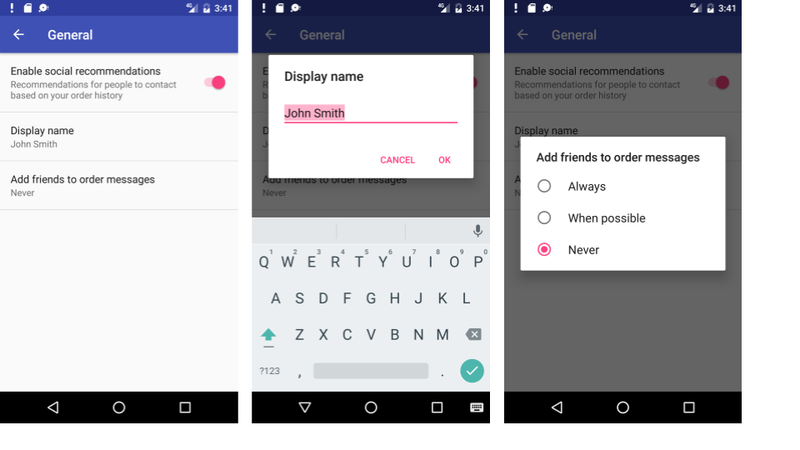 Select app at the top of the Project > Android pane, and choose New > Activity > Settings Activity. Click the three dots at the end of the Hierarchical Parent field and choose the parent Activity (usually MainActivity), so that the Up app bar button in SettingsActivity returns the user to MainActivity. Choosing the parent Activity automatically updates the AndroidManifest.xml file to support Up navigation. SwitchPreference: A two-state option that can be toggled (such as on/off or true/false). EditTextPreference: A dialog with an EditText. String resources in the strings.xml file in the res > values folder of the Project > Android pane, which you can customize for the settings you want. SettingsActivity in the java > com.example.android.projectname folder, which you can use as is. This is the Activity that displays the settings. SettingsActivity extends AppCompatPreferenceActivity for maintaining compatibility with older versions of Android. AppCompatPreferenceActivity in the java > com.example.android.projectname folder, which you use as is. This Activity is a helper class that SettingsActivity uses to maintain backwards compatibility with previous versions of Android. The Settings Activity template provides an Activity (SettingsActivity) that extends PreferenceActivity to create a two-pane layout to support large screens, and also includes a Fragment for each group of settings. This is a useful pattern if you have multiple groups of settings and need to support tablet-sized screens as well as phones. The related practical is 9.2: App settings. How does one get dimens.xml into Android Studio? Determine if the device is a smartphone or tablet?